HAVE YOU OR A LOVED ONE BEEN INJURED OR DIED IN A TRAIN ACCIDENT OR A SUBWAY ACCIDENT IN NEW YORK? Subway and train operators, and their parent companies have a professional obligation to ensure that passengers are transported safely to their destination. If an operator negligently fails to deliver passengers unharmed, injures pedestrians, or injures passenger vehicle occupants, the employee and his or her company may be found negligent. To successfully litigate these types of cases, an attorney must have full command of the transportation law as found in Title 49 of the United States Code and be familiar with the various regulatory agencies for these types of accidents. For example, accidents to railroad workers are covered by FELA (Federal Employers Liability Act) and The Federal Transit Administration covers subways and mass transit. Our train and subway accident lawyers have a comprehensive understanding of this body of law and the experience necessary to develop strong cases for clients who have been injured or for the families of those killed in a subway or train accident. The Metropolitan Transportation Authority (MTA), New Jersey Transit (NJT) and other agencies employ internal investigators to collect evidence and conduct an investigation into the cause of subway and train accidents. 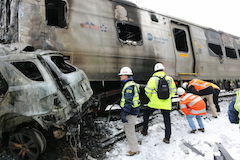 In order to ensure important eyewitnesses are located, conductors interviewed, and physical evidence preserved, the experienced train accident lawyers of Gair, Gair, Conason, Rubinowitz, Bloom, Hershenhorn, Steigman & Mackauf initiates an independent investigation process as soon as possible when seeking damages for a subway or train accident. If necessary, we also retain expert accountants and financial analysts because many subway and train accident cases have their own set of associated losses including lost wages, the cost of care and many other monetary costs. In order to accurately assess what these costs will be for the remainder of a victim’s life, we use financial professionals to derive fair resolutions for injury victims. If you have been injured in a subway or train accident, please Contact our New York train accident attorneys to discuss your case.